So I’m reaching here by calling this a buying guide as it’s not really an objective review of the market. Instead, I’m going to share my research and thoughts for how I ultimately selected the pressure cooker that I currently own. Since I started posting about my new found pressure cooker obsession a few weeks ago on Facebook, I’ve had a number of people ask great questions…. 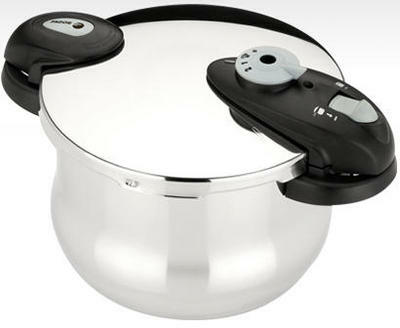 How did you get started and choose a pressure cooker? Aren’t those things dangerous? Do people under the age of 65 really own pressure cookers? So read on, not really…and yes. Naturally, there was a noticeable amount of concern and trepidation at home when I said I was thinking about getting a pressure cooker. I’m pretty sure my wife envisioned me not paying attention to the dials and the vessel subsequently exploding with such a force that would blow a hole in the ceiling and line the kitchen in leeks and carrots. Fear not! Modern pressure cookers are outfitted with a variety of gaskets and pressure relief valves that, provided you follow their common sense guidelines, should not cause a high pressure catastrophe. How else do you narrow down the field? Let’s start with a quick review of the fundamentals of operating a pressure cooker. When reading pressure cooker recipes, there’s a consistent pattern you’re going to see. You always seal and heat the pot until steam starts to escape. Once an indicator on the cooker shows that full pressure has been reached, you start a timer for the cooking time. From there, you regulate the temperature to keep a steady flow of steam until the time is up. Then, stop cooking by running cool water over the lid to release the steam and lower the internal pressure. This brought me to the first decision point: electronic or stove-top. The electronic models follow in the footsteps of modern slow cookers, deep fryers and rice cookers where a programmable timer and a temperature regulator are used to make usage very straightforward. They handle the initial heating, managing the cooking time and the releasing of the pressure. All on your counter top. From here, there was a question of the size of the container. Electronic models, while appearing very convenient, tend peak at 6 quarts. For already cut-up vegetables, normal pieces of meat (roughly 6 ounces) and other small items, this is a perfect size. Since I was thinking about cooking larger cuts, and maybe even doing some light canning, 6 quarts would be too small. When looking at the traditional models, the next breakpoint in size is around 10 quarts. This is larger than your average stockpot and is able to hold an 8 pound bone-in ham (which I did recently). At the 10 quart tier, you could also fill it with a couple of small mason jars, should you want to preserve your strawberries through the winter. The next step up is around 20 quarts. These have large locking bolts that make you think they are designed for securing spent nuclear fuel. And since these are massively sized, they’ll take longer to heat and require more space to store. But, they are great for holding large canning jars, and that’s probably the key reason you’d buy something this large. So I landed on a 10 quart model from Fagor and have been having fun with it so far. If you follow the blog, there will be many more pressure cooked recipes to come…. Education is the only and most important asset which helps us to bring other assets. We can produce all other assets with the presence of education. Think for a while and get ready for it.